When I opened this lovely bundle of Liberty fabrics, I had the good surprise to find that they were all different from the ones of my own stash! I am going to use them to complete my hexagon pillow. So happy to have such pretty new fabrics! The tutorial to paper piece the hexies is here. OMG...LOVE your hexagons! I'm sew sorry... 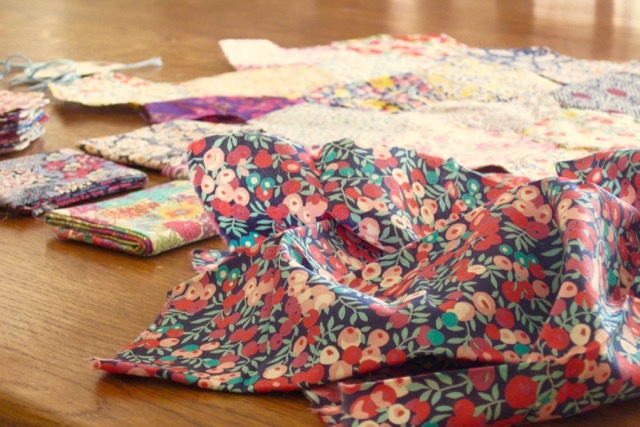 I drooled all over your gorgeous Liberty fabric! This quilt is going to be stunning! Such pretty fabrics and love the hexies! Gorgeous! Those hexies are fabulous!! Les Liberty donnent du beaume au coeur grâce à leurs belles couleurs ! Ton quilt va être magnifique ! 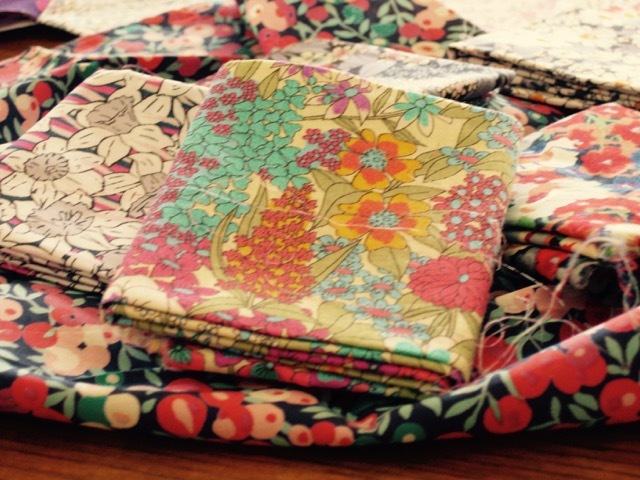 Perfect use for your beautiful Liberty fabrics. Lovely Liberty prints! How large are your hexagons Christine? Love your fabrics; I have the same fabric with the dark background and the orange and various other colors. I have yet to try EPP, but have been seeing some fabulous tutorials (yours included) lately and am really thinking about trying a small project. A pillow would be a good one to start with. Thank you for sharing and have a wonderful creative day! This is going to be a lovely pillow; Liberty prints blend so beautifully. 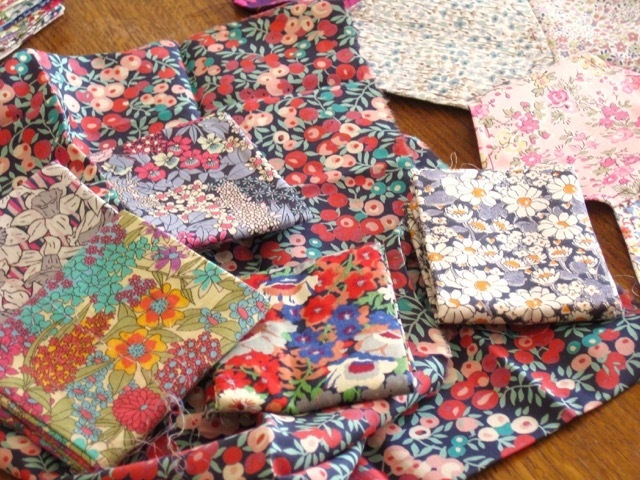 I like liberty fabrics a lot. I like these large hexies too. 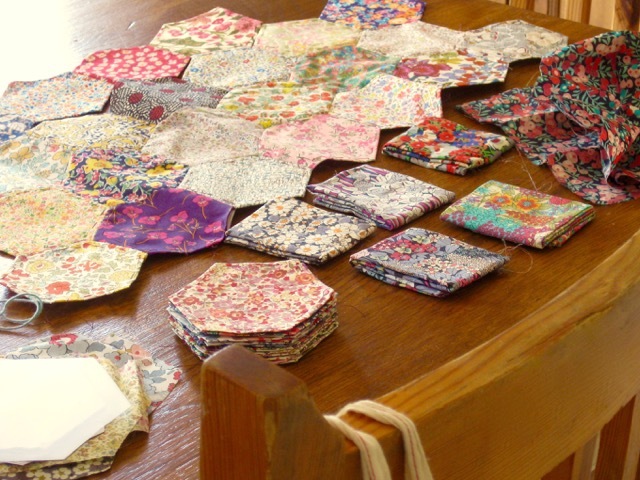 I have a lot of hexies...a long term project in progress. I never looked to see how the hex quilts are backed. I'll have to research that!! Such gprgeous frabric. One of my star has a center out of a Liberty fabric. It is so soft and soothing. You are one lucky quilter to have that fabric to work with. Wonder where in the States I could find some. It's going to be a wonderful pillow. Thanks for sharing. New fabric is always so much fun. Looks like a great variety of prints to add to your collection. At first glance I thought Liberty. What a beautiful new stash you have. The hexies will be gorgeous. Aren't these pretty, (love the feel of Liberty) I just want to roll in them. Liberty Lawn prints are on my wish list. I like your use of making them into large hexagons. So beautiful--it will be like a carpet of flowers--lovely! I love the way liberty fabrics feel. This will be a very pretty quilt! Very pretty. I got a bag of liberty scraps about 5 or 6 years ago... I really should pull them out and see what is in there. 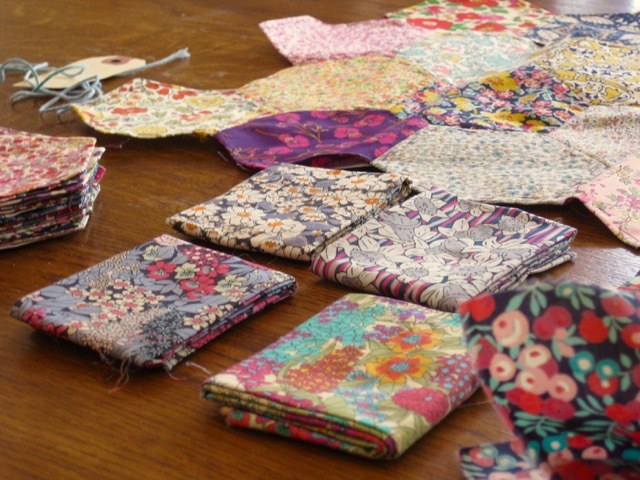 Such beautiful liberty fabrics! Enjoy stitching with them... they feel so wonderful! Oh such gorgeous fabrics and what a great way to use them! Christine, these fabrics are amazing! And you're doing them proud. I can't think of a more perfect way of displaying your lovely collection of Liberty fabrics! It's wonderful that they make so many different prints. I'm sure I could spend hours looking at each hexagon. You're combining them beautifully too. Such pretty farbics. My friend uses many Liberty prints and recently made a fox quilt with them. You can see a picture of it on my blog two posts ago. It looks amazing. 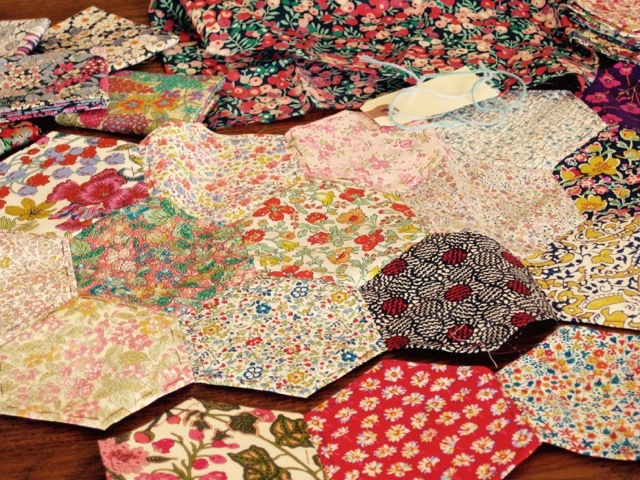 Your hexagons are gorgeous, you can't go wrong with Liberty can you.